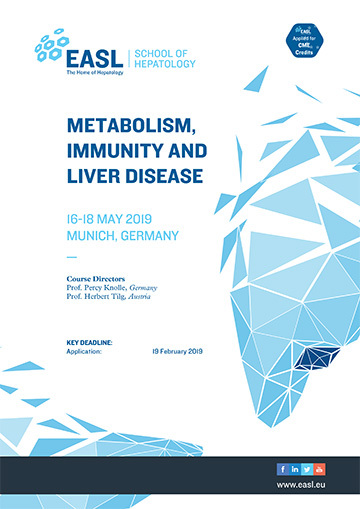 We welcome you to the EASL School on Metabolic inflammation, immunity and liver disease which will take place at the TUM School of Medicine University Hospital rechts der Isar from May 16th to 18th, 2019. The EASL school on Metabolic inflammation, immunity and liver disease will allow you to meet key experts of the field, develop a thorough understanding of key and cutting edge technologies, engage in discussion about the burning scientific questions and current as well as new developments in the field. Excellent scientists from the fields of metabolism, liver immunology, NASH, viral hepatitis, microbiome and proteome research form an outstanding faculty for you to engage in a lively discussion embedded in a hearty Bavarian atmosphere. We are looking forward to seeing you in Munich!